Everything within empty and semi-laden container handling. 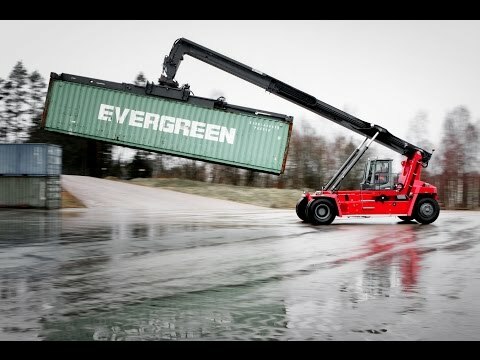 With the Kalmar DRG100-120 you can handle all types of containers (standard ISO, reefers, tanks, specials and flat racks) and slinged loads up to 12 tonnes precisely and safely. It also offers the rotation necessary for efficient action in confined spaces. Plus you get the quality that makes your business prosper, both in the short and long term. Fully equipped – safe and sound. The Kalmar DRG100-120 is extremely stable – it’s the only reachstacker on the market with the high-capacity 5.4 m wheelbase. It has the best combined lift capacity in rows 1-2-3, a spreader with the biggest side shift and 4 extra lift hooks, front and reverse tilts, twistlock status indicators, dual rotation motors and brakes, and a complete LED lamp kit as a standard. Options included, among others, a Reverse Aid Warning System with a detection range from 0,5 up to 9 m.